The literal translation of “Li Li Xiang” means sweetness in every bead (of tea leaf) and describes this tea perfectly. The tightly rolled green leaves give off a pure and balanced aroma. When infused, the tea leaves produce a mellow concoction that is incredibly floral and sweet. The aftertaste is much more flavorsome and astringent compared to our other Tie Guan Yin. The quality of the tea is reflected in its ability to reproduce the delightful taste brew after brew. 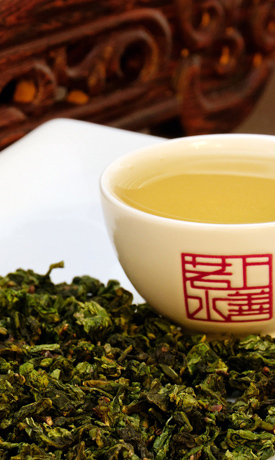 The Li Li Xiang Tie Guan Yin is certainly a crowd pleaser; a must-have in your collection. This tea is so close to perfect that I think I heard angels sing when I took my first sip! Seriously, this is an incredibly lovely Oolong – so smooth and elegant! The aroma is slightly floral and slightly vegetative. It is an interesting balance of sweet and savory scents that I find very intriguing. The liquor is sweet and buttery. The buttery flavor is expressed in the mouthfeel as well; it has a very thick texture that is a bit like melted butter. Not oily, but, thick the way melted butter would be and with the sweet, creamy note of melted butter. It is truly silky and luxuriant as it glides over the palate. The flavor has a pleasant floral taste – I am not getting much of a vegetative note like I expected I would after smelling this tea. But that’s quite alright. I find the floral note to be very mysterious and adds to the luxuriousness of this tea. This tea does have a slightly drying astringency and even a faint hint of bitterness – but it’s a good bitterness that keeps the palate from becoming too saturated from the buttery sweetness of the tea. The bitterness cuts through that sweetness just enough to keep the tea interesting and not cloying. It’s truly delightful! Even though the weather is on the warm side as I type this, I am still enjoying this tea hot (not too hot, mind you, but warm enough to keep from being considered an iced tea), and I really believe that for full enjoyment of an Oolong such as this, it should be enjoyed hot rather than iced. It is delicious iced, but, so many teas are delicious iced – with a beautifully complex tea such as this, it should not be wasted on iced tea but enjoyed to its fullest as a hot tea – so that the many layers of flavor can be detected and savored.